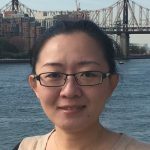 Dr. Liu is aiming to uncover the defects that are responsible for male infertility by identifying key changes to the chromosome that could potentially prevent the deleterious effects of cancer treatments, such as chemotherapy or radiation, which can result in sterility in up to 50% of patients. This research could lead to treatments to prevent or even reverse infertility and lead to the development of a method to convert stem cells into functional reproductive cells. She is currently conducting her postdoctoral studies at Weill Cornell in Dr. Shahin Rafii’s lab.